After the death of Francesco Sforza, Duke of Milan, in 1466, his son Ludovico il Moro asked Leonardo da Vinci to create the largest equestrian statue in the world, in memory of his father. The commission was paid in advance by the court treasury superintendent, and Leonardo’s workshop, which was located where the Palazzo Reale now stands, was supplied with all the tools and materials needed for the fusion of the sketches. Leonardo immediately understood the great expectation that the Sforza family was placing on that statue and, as usual, he undertook a long course of study to produce the best result. For this reason, in 1482, he sketched a monument that would eclipse all the previous equestrian statues, in particular the one of Colleoni, created by Verrocchio who had been his teacher, and the one of Gattamelata, created by the famous Donatello. In reality, Leonardo’s attention was more focused on the horse than the rider. The horse was supposed to be huge and in the rampant position, in the act of breaking down the enemy. With this in mind, he thoroughly studied the horses’ anatomy in the ducal stables, and filled sheets with drawings of steeds famous for their beauty. Among Leonardo’s sketches there are notes such as: “Morel Fiorentino is big and has a strong neck and very nice head”, or “Ronzone has beautiful thighs …” He was looking to assemble parts of different horses in order to shape the perfect one into a work of art. Soon, however, Leonardo realized that the project had to be rethought, since a colossal ramping horse four times larger than life would face big statics problems. Unfortunately, his studies were slowed down in 1491 by the policy of marriages followed by the duke, who involved him in the preparation of two lavish weddings celebrated in the nearby city of Pavia, and followed by a period of festivities in Milan: Ludovico il Moro married Beatrice d’Este on 17th January, and Anna Maria Sforza married Alfonso I d’Este five days later, on 23rd January. The guests were the noble relatives of the most prominent European families. The two ceremonies were followed by huge celebrations including a three-day tournament, from 26 to 28 January, for which Leonardo also designed some costumes. When he was finally free to resume the project, Leonardo envisioned a horse moving, with a raised leg, and produced the final model in time to be exhibited during the celebrations of yet another wedding, the one held in Milan on 16th March 1494, between Bianca Maria Sforza and the emperor of Austria, Maximilian I of Habsburg. The artwork received huge praise for its beauty, and was now ready for the wax casting with 100 tons (220,500 pounds) of bronze! Nobody had ever taken on such a challenge before. But at this point war upset all the plans. The king of France Charles VIII, looking to inherit the kingdom of Naples, made a deal with Milan, Venice, Florence and the Papal State so that they would let him reach Southern Italy unhindered. He arrived on 3rd September 1494, and Naples was effectively occupied on February the 22nd. But the many raids of the French pushed the Italians to form an anti-French league supported by Spain and Emperor Maximilian too. Naples was liberated and Carlo returned home, but he was succeeded by his combative cousin Louis XII, who claimed for himself the Duchy of Milan as the nephew of Valentina Visconti, the family dethroned by the Sforza. Given the danger and having lost his allies in defending Milan, Ludovico used the bronze set aside for the horse to forge cannons, to no avail. In 1500 Louis XII eventually had the upper hand and conquered Milan. Leonardo had to flee and was forced to leave the huge clay model behind, in the Castello Sforzesco courtyard, where the French crossbowmen hit it and destroyed it completely. This sad story has an incredible happy ending, though. 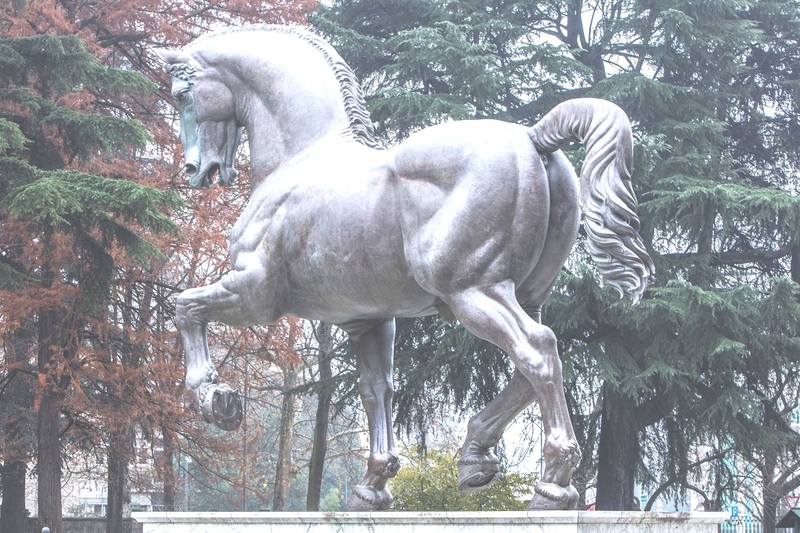 In 1977, Charles Dent, an American pilot, politician, art collector and sculpture lover, decided to bring Leonardo’s dream to life and to donate a bronze horse to the city of Milan. He was especially grateful to this city for hosting and supporting the Renaissance. Dent searched for the original sketches in several museums and assembled a scientific committee of Leonardo’s experts in order to complete the missing parts. Dent then established the “Leonardo da Vinci’s Horse Foundation” (Ldvhf) and started a fundraising campaign which raised almost 2.5 million dollars in 15 years. Unfortunately, he could not see his dream come true, because he died in 1994, before the horse was completed. The project was taken over by Frederik Meijer, owner of a supermarket chain, who offered to complete Dent’s project, provided that two copies of the horse would be produced: one for Milan and one for his own “Meijer Gardens”, a nature park in Grand Rapids, Michigan, where Meijer collects outdoors copies of the most famous statues. The direction of the works was entrusted to the sculptor Nina Akamu, who finally took over the endeavour. The Ldvhf attached the condition that the horse would be exposed in a place with adequate security, and that is how the beautiful gallop racecourse of San Siro was chosen. The seven parts of the horse arrived in Milan in 1999, where they were welded together. In September, during a solemn ceremony, the statue was placed on its marble base about two metres high, with plaques describing the Ldvhf story and the names of those who participated in the fundraising. The second copy, known as “the Grand Horse” is now on show in the Meijer Gardens and is the highlight of the exhibition, which attracts over half a million visitors each year. Finally, a 2.5 meters (8,2 feet) replica was donated in 2001 to the city of Vinci where Leonardo was born, and it is now located in Piazza della Libertà. Since 2001 Leonardo’s Horse is also the symbol of the “Milan International Film Festival” Awards. and are kept in Windsor Castle.